Did I mention that my bread machine can make jam? It can! We now have banana jam on a regular basis. 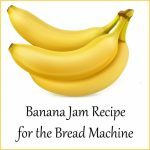 What’s banana jam like? It’s a refrigerator jam that’s pretty tasty on toast. It also double as ice cream topping and is a nice addition to plain yogurt.